My girlfriend, who is just 2 months away from having a Master's in Epidemiology, attended a Public Health conference this past weekend. During this luncheon, she happened to sit next to a Federal Veterinary Scientist. Their discussion eventually turned to the bird flu and the preparations the State of Wisconsin is taking to deal with this potential pandemic. The picture she painted was nothing short of catastrophic. This Veterinary Scientist indicated that current projections stand that 50% of Wisconsin residents are expected to die if the bird flu virus mutates from its current Stage 4 to a Stage 6 Pandemic, where the virus can be spread from human-to-human. This federal official did not say that this was a worst-case scenario, but the most accurate prediction! According to the State's plan, since a vaccination cannot be produced until this Stage 6 virus is present, only government workers would be given doses. That's because the final vaccine must match the mutating virus before mass-manufacturing begins. Since worldwide vaccination would be impossible to achieve in enough time to contain the spread of the virus, everything would shut down & residents would be confined to their homes for months. Treated government workers would then go house-to-house to distribute food/water & other necessary services. A few recent studies do confirm what this Veterinarian indicated, but to a much lesser extent. One study released this week by the Australian-based Lowy Institute Think Tank indicated as many as 142 million people around the world could die if bird flu turns into a "worst case" influenza pandemic. Global economic losses could reach $4.4 trillion. Even projections of a mild pandemic could kill 1.4 million people and cost $330 billion. My first reaction was one of disbelief. Would our government, who's current regime thrives on scare tactics, keep this potential disaster under raps as to not cause a mass panic (or have I been watching too many "24" episodes?) Or is this dooms-day scenario not likely to occur at all? I always look to our wonderful mass media for answers. If there was the smallest chance that the bird flu pandemic could reach these epic proportions, the media would plaster these dooms-day scenarios across the airwaves every second of every day. At present, the bird flu is still backpage news. But with the virus quickly spreading throughout Europe & Asia, the media blitz will explode once the virus reaches the United States. 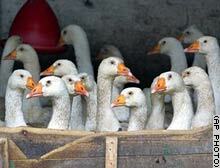 Are we underestimating the potential damage the bird flu will inflict? Don’t build a brick bunker in the backyard or buy 500 cans of Spaghettios just yet. If the bug jumps from birds to humans, there’s still no guarantee that it will be any worse than any other flu that races across the world. It may be no more harmful than the much-hyped Y2K bug that incited needless panic among investors and politicians in 1999. Now, of course, this is no Epidemiology blog. In Part 2, we will examine the effect the bird flu will play on the markets & where to look if it does reach global-wide pandemic proportions. The real problem is that there is a possibility that H5N1 could mutate and cause a pandemic, but we do not know enough about viruses to say what the chances are. It could happen tomorrow or it could never happen, no one knows. It is also a possibility that the deadly form of the virus dies off. The “catch-22” for government agencies is that if they don’t prepare for a pandemic and one occurs they will be held accountable and if they prepare and the mutation never happens then they will be blamed for overreacting to hype. In reply to why our government is not hyping AI, I feel that if executive branch had a financial stake in, lets say, pharmaceuticals and poultry instead of defense contractors and oil, they would be riding this band wagon all the way to the bank. So what are your stock picks?